Yikes---I am looking through pictures realizing we have seen so much of Florence... and documented too little. These pictures are actually from a day we recently spent in Fiesole---the famous Etruscan hill town that preceded and now overlooks---Florence (8 kilometers north via bus). In Fiesole, there are famous ruins of a roman amphitheater, including pools and ovens and baths. The best part of seeing the amphitheater was walking down the steps and standing exactly center stage, then projecting one's voice. The acoustics were astonishing. You would speak, no utter, some words and they would reverberate back to you. It was just... cool. Caleb thought it sounded like you were talking into a balloon, how it echos and vibrates and increases in sound all at once. It almost made you want to belt out and sing; actually it made me think of my brother and sister-in-law who frequent the stage. And the history, and importance, of theater through the ages. We also simply walked around the little city, through a little market in the piazza (where I bought lampone [raspberry] preserves, and 3 little jars of honey---named after the specific flowers the bees suckled in order to make the honey: sunflower, pomegranate, acacia), and to well-appointed spots to look back and down over the city of Florence. Janelle, I just wanted to let you know how much I enjoy reading your blog so I can live vicariously through your adventures. Michelle and I loved visiting Firenze when we lived in Germany. There was an antique clock in Fiesole that we always regretted not buying. Steve: hey! So great to hear from you! When/why Germany? Do you think the clock is still there? I could look for you?! (p.s. clarify: clock in Fiesole not Germany;)). Oh Florence is one of my favorite desinations. Love your photos! When we were in Florence in April, we were enjoying a bottle of wine on the rooftop of our little hotel when 2 older couples joined us. 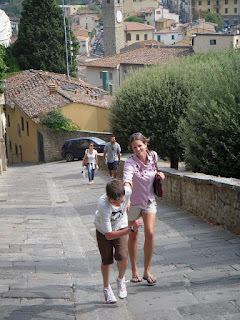 They'd spent the afternoon in Fiesole and had clearly enjoyed the beverages there! It was fun to talk with them and to picture ourselves visiting again at their ages, just laughing and enjoying life.